As I continue to reflect back upon 1L year, I am trying to remember any of the things I was concerned about prior to starting law school. Now that I have a year under my belt, I am going to try my best to blog about those concerns I had and hopefully clear it up for future law students! 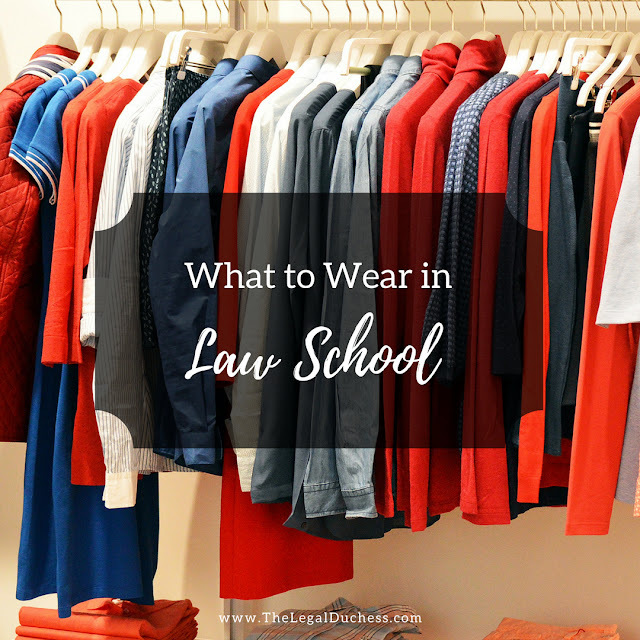 Up first, what do you wear in law school? I, being the type A person that I am, was super concerned about whether or not people got dressed up every day or if it was just like undergraduate college full of oversized t-shirts and leggings. All my stress was for naught; I ended up being dressed perfectly acceptable for law school and my wardrobe was sufficient. Still, I am going to share the general wardrobe to help ease anyone who worries like I did. Most days, I dress pretty simply for law school. Jeans, nice tops, and nice shoes. I make a point to do my hair and makeup every day and generally, I do put effort into my appearance. My reason for this is that you never know who you will meet while at school. A local judge may be stopping by or an attorney you would like to intern with. Dressing classy and looking put together is always a good idea. Avoid the oversized t-shirts and leggings through the semester but come finals time- those are perfectly acceptable! I choose semi-conservative/modest clothing. I am among my future professional peers so I want to project a professional image from the beginning. You do not want to be known as the lawyer who dressed in too tight or too low cut clothing during law school. I draw a lot of wardrobe inspiration from the envy of all women- HRH Catherine, Duchess of Cambridge. She has mastered the ability to look drop-dead gorgeous while maintaining a classy, modest, royal look that will never go out of style. I love everything she wears and I try to dress in a way that emulates her fantastic style without her massive fashion budget. TJ Maxx, Poshmark, Marshalls, Ross, Burlington, outlet malls and boutiques are many of the ways I get the high- end look for less. There will days and events that will require you to dress professionally. This means it is time to invest in a quality suit (generally a skirt suit is preferred for ladies because it is more traditional). I suggest a darker color for the traditional aspect. This suit will serve you well from oral arguments to internship interviews. A big key is to have your suit be well fitted- spend a little extra cash and have it tailored if off the rack does not flatter your body type. As much as they stink, flesh-colored nylons are the best for professional wear. Ladies, also invest in comfortable heels with a low heel and in a plain matte or patent leather. My favorite pair is the comfort plus from Payless- comfy and they don't break the bank! Beyond a good suit or two, there will be days full of business casual and summers full of internships. 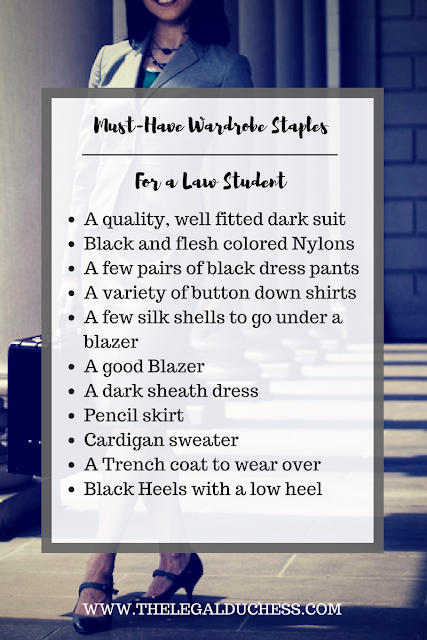 It is great to start collecting a wardrobe of basic dress clothes so you don't have to spend a small fortune right before your internship starts or having to run to the store the night before an event for a new pair of dress pants and a button-down. I have been stocking up for a long time and I have a nice little collection which I am using currently in my summer internship. Never underestimate the use of a good pair of black dress pants or a well-fitted button down. I also invested in a nice wool dress coat. It was perfect for winter interviews and I know it will serve me well in the future! I also have a regular trench coat for rainy days and cool fall or spring mornings. I generally wear small stud earrings (particularly when dressing professionally) and I have been slowly working towards good jewelry to with all of my professional wear. I have a tote bag I use for my internship and other professional events. It is just a big, plain dark-colored leather with plenty of space. I also have a pair of black flats that are very comfortable while still looking professional for the days when I have to walk all around downtown for my internship. I know it seems #basic to be so concerned about what to wear but I have always felt that the right outfit makes the right first impression and also helps me to feel confident and prepared. You are entering professional school and making your first foray into the legal world- dress for success. I'm about to start my 1L year and I have spent a fair amount of time wondering what to wear! I actually had a nightmare that I was stuck in class wearing nothing but a sports bra and workout shorts, so this was very helpful, thank you! Thanks for posting,I'm starting this fall and this post really helped to settle my mind on what to wear. Thank you! I think about this everyday. Business Casual everyday sounds about right. So would an oversized hoodie and pants be deemed inappropriate for day to day classes, lectures, etc.? I would not say it would be inappropriate to wear that on the day to day class schedule but I would also not make a huge habit of it. You never know when the local judge will be visiting the school or when you have to meet with a professor so it is good to also present a semi professional picture with something as simple as not ripped jeans, a nice fitting tee, flats and neutral makeup with a soft ponytail. I just described my usual day to day style. But there are certainly days where I just grab a hoodie and leggings and run out the door... after all we are still college students and can get away with it for 3 more years! Thank you! This is so helpful and much appreciated! I'm entering my second year of law school. I have an okay suit, but I've gained weight. Do you know of anywhere that sells nice suits for curvy women? Most plus size stores have stuff that's too big for me, but regular stores sometimes don't have my size. I'm at a loss! I don't know what store would be best! My advice would be to just spend a saturday trying out different stores and see what fits best within your budget.